BELLEVILLE – As thousands of people lined up and cheered outside, Prime Minister Justin Trudeau and his cabinet were sworn into office at Rideau Hall Wednesday. Canadians showed up in droves outside Rideau Hall, the governor general’s official residence, to witness Trudeau arrive and officially become Canada’s 23rd prime minister. “Sunny ways, guys, sunny ways,” said Trudeau to his party as they walked past the crowd, echoing the Wilfrid Laurier quote he cited after winning on election night. 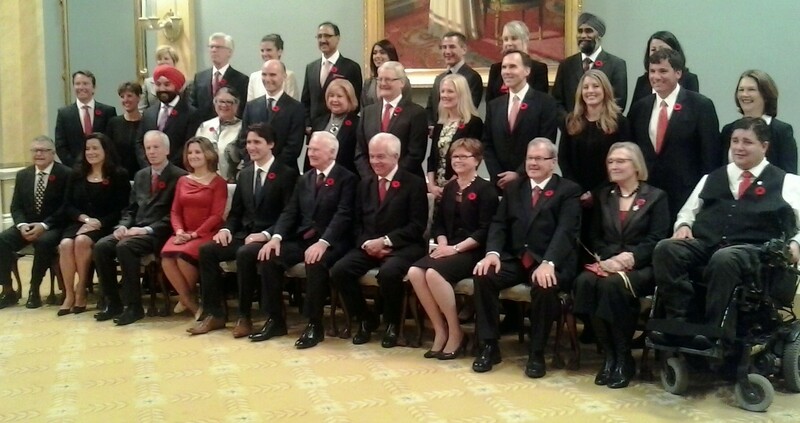 Thirty new cabinet ministers were there alongside him, representing 11 of 13 provinces and territories, ethnic diversity and, as previously promised by Trudeau, an equal balance of women and men. “It’s an incredible pleasure to be here today to present, to Canada, a cabinet that looks like Canada,” Trudeau said in an address to the waiting crowd after being sworn in. Asked why he placed importance on having a gender-balanced cabinet, Trudeau had a quick response. “Because it’s 2015,” he said, to cheers from the crowd. He added that although not every member of Parliament could make cabinet, he would work to ensure their voices were heard. No MP-elect from Quinte-area region was appointed into the cabinet, although Maryam Monsef from the nearby Peterborough-Kawartha riding was named minister of democratic institutions. Trudeau fielded questions on some of the most timely issues the new Canadian government faces, including his party’s promise to bring in 25,000 Syrian refugees by the end of the year. Trudeau was also asked about how the government will handle the upcoming climate change conference in Paris, which begins on Nov. 30. Trudeau was referring to Catherine McKenna, the Ottawa MP who was appointed to the renamed and expanded environment portfolio. The new prime minister then left Rideau Hall after taking questions, but not before spending a half-hour interacting with the crowd. Luanne Vendittelli was one member of that crowd. She worked on Trudeau’s campaign and was emotional after hugging the new prime minister. She said that Trudeau would give Canada a better future. A group of students from the University of Ottawa said they were enthused about what Trudeau said. “I thought it was important when he addressed seeing a more Canadian Canada. Having an equal (gender) cabinet, while forced ratios aren’t necessarily perfect, it’s a step towards a better future,” said 19-year-old Natalie Plauaini. Matina Turchyn, also 19, said she wants to see the environment become a major focus of the new government. “I think it’s important we talk a lot more seriously about the environment. The fact that he changed the name (of the minister) to environment and climate change, I think that’s a step in the right direction,” said Turchyn. The turnout was impressive, she added.